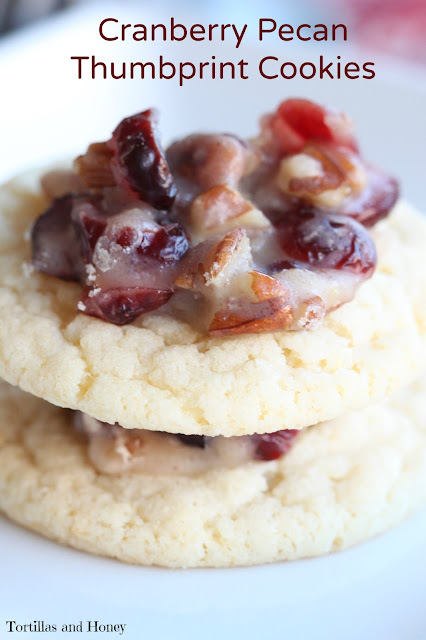 These Cranberry Pecan Thumbprint Cookies are brought to you in collaboration with Betty Crocker® to help bring you easy and festive cookie recipes this holiday season! As always, the recipe and opinions in this post are my own. This year, spread cheer with simple surprises! The holidays are meant to show those you love that you care about how much they mean to you. For busy individuals, sometimes it's a little harder to find the find to do special things for those especially during the holidays. I've found that Betty Crocker® Sugar and Peanut Butter Cookie Mixes are a great way to help you create something special to share with friends and family! While doing my regular shopping at Walmart, I've come across Betty Crocker® Sugar and Peanut Butter Cookie Mixes that already have the dry ingredients mixed together and measured out. Through the years I've found that these are great mixes to help you make homemade cookies and they also serve as a great base for making other cookie creations! Every year I make probably 15-20 dozen cookies to give out to family, friends, and co-workers. Last year I was even successful and sent out packages to family and friends that live out of town! I was so proud of myself especially because at the time I was also going to school part-time for my Masters while working full-time. While I wish every year was like that, the reality is that life doesn't always happen the way you've planned! This year I'm finding it hard to find the time as well as motivate myself for my annual Christmas baking. The sugar cookie mix has been a little bit of a lifesaver because with this mix I won't be forgoing baking all together, though I won't be doing nearly as much as I usually do! I decided to use the sugar cookie mix to make "thumpbrint" cookies, then fill them with a cranberry pecan praline. The praline isn't brown sugar based, but uses white sugar but it hardens up and reminds me a little like traditional praline. While the cookies are cooling, you can make the praline which takes less than ten minutes, then fill the cookies immediately! All the great things about these cookies are that they are beautiful, they taste SO good, and they take about half an hour to prepare! I also have available for you a coupon for $0.50 cents cash back rebate on your purchase of one of Betty Crocker's Cookie Mixes! Please click the link above! How are you spreading cheer this holiday season? What tips do you have to create simple and delicious treats? Heat oven to 375 degrees F. Stir cookie mix, melted butter and egg in medium bowl until soft dough forms. Drop dough by rounded teaspoonfuls 2 inches apart onto ungreased cookie sheet. Bake as directed or until edges are light golden brown, 7-9 minutes. One minute before the end of baking time, remove from oven and use the end of the handle of a wooden spoon to make an indention in the middle of the cookie. Place back into the oven and bake for 1-2 minutes until light golden brown. If the middle have puffed up again while finishing baking, redo the indention on the cookies. Cool 1 minute before removing from cookie sheet, then cool completely. In a medium saucepan, melt the 8 Tbs. of butter and sugar over medium heat. Stirring constantly, cook the mixture until it is bubbling and thick, about 5-6 minutes. Stir in the cream, vanilla extract, pecans, and cranberries. Cook the mixture for 4 minutes, stirring constantly. Remove from heat. Place about a teaspoon of the praline mixture into the center well of each cooled cookie. Let the mixture cool completely before serving. Store in an airtight container in a cool place. These cookies will be good 3-5 days after making.